Taylor Limited Edition Display Guitars at NAMM 2019! Pictures of Every Taylor Special Event Display Guitar at NAMM 2019! Click here to see pictures of all of the Taylor Custom Shop guitars that are on display at the NAMM 2019 show! Limited Guitars Are Available to Order at The Music Zoo! These guitars are limited edition, but also some available to order - if you see a picture of something that catches your eye and you need in your collection, contact The Music Zoo sales team to make it happen! There are lots of exciting pieces on display this year, highlights include Custom #11053 which is a AA-Grade Koa Grand Concert with Tropical Vine Inlays and #11075 - a Grand Auditorium with Premium Sitka Spruce and classy Cocobolo binding! Winter NAMM 2018 Coverage: Take a gander at these top-shelf Taylor Custom Shop NAMM showpieces! The Music Zoo is one of the top independent Taylor dealers in the world, and we've been treated to a sneak peek of their best NAMM pieces! Keep scrolling for the full list! NAMM 2018: Taylor Guitars Introduces New "V-Class" Bracing! ﻿Winter NAMM 2018 Coverage: Taylor Guitars is innovating once again - this time with a new acoustic guitar bracing system, known as "V-Class" bracing! The Music Zoo is proud to be one of the biggest independent Taylor dealers in the world and we're exciting for this new offering. George Gruhn himself even called it a "genuine innovation". Event Recap and Video: Taylor Guitars Road Show ! 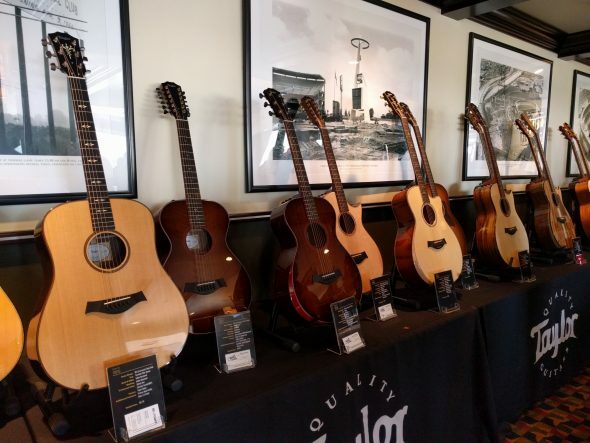 The annual Taylor Guitar Road Show made it's usual pit stop at The Music Zoo last week! A big thanks to all who attended and thanks to the Taylor team! If you've never been to a Taylor Road Show - it's one of the best educational, company-lead presentations in the business! NAMM2017 We attended Taylor’s exclusive custom shop event to get a first look at the latest custom and one-off models the brand has to offer. We had a ton of favorites, and we’re sure there are a couple here that’ll pique your interest. Have a look at what was presented, and if you see something you like, be sure to contact us to pre-order! 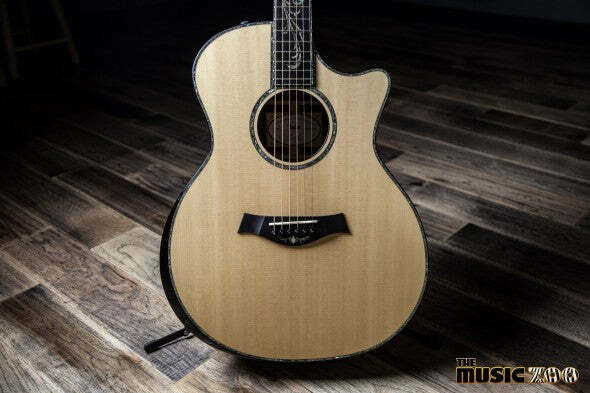 Taylor’s Presentation Series guitars are truly the pinnacle for the esteemed guitar company. They use the finest sets of wood with elaborate inlay work, the very best materials, and classy appointments such as Gotoh Gold tuners and a bone nut and saddle.